Scary Monsters magazine #102 - Agar the B-Star Issue - Almost Sold Out! MyMovieMonsters.com > Scary Monsters Magazine > Scary Monsters 101-Current > Scary Monsters magazine #102 - Agar the B-Star Issue - Almost Sold Out! 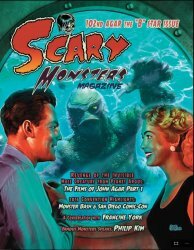 From the Revenge of the Creature, Tarantula, the Mole People and Daughter of Dr. Jekyll, to Attack of the Puppet People, the Brain from Planet Arous, and Invisible Invaders, Scary Monsters Magazine #102 puts the scary spotlight on John Agar, the king of the B movie science fiction horror films of the 1950s. In addition to Monster Kid favorites like Kaiju Korner, Mazza's Scary Stills, Dr. Gangrene's Mad Interview, and Tiny Tales of Terror, Scary Monsters #102 will also feature Al Adamson's much-hyped yet disappointing 1971 clunker Dracula vs. Frankenstein, an interview with femme fatale movie and TV actress Francine York, a revisit with cosmic comic superhero ROM: Spaceknight, highlights from San Diego Comic-Con International 2016, Monster Bash and much, much more! Join Sam Scare and the rest of the gang as we continue to celebrate the 25th anniversary of Scary Monsters Magazine! Did Barnaby Exploit the Bogeymen? Full color cover and vintage B&W content. 144 pages plus cover. Published September 2016 by MyMovieMonsters.com. Editor in Chief: Don A. Smeraldi. Art Director: Vicki Smeraldi.